This old GorkaMorka miniature was a pleasure to paint. I think that Nazgrub was sculpted by Brian Nelson, but Collecting Citadel Miniatures didnt have info (and listed the poor poor old guy as “Nazgrun”. It also has Nazgrub listed in the “Digga” section. He wont like that). The model has a lovely bark like skin and in particular facial texture that reminds me of old Paul Bonner illustrations. The skin really was very enjoyable to paint, even with the straightforward layering approach that I took. Nazgrub is a special character in GorkaMorka that shows up to aid underdog factions. Nazgrub is a medium level psychic (or “Weirdboy” in ork parlance) that uses ESP to detect particularly rich veins of scrap (scrap being the currency of the planet). 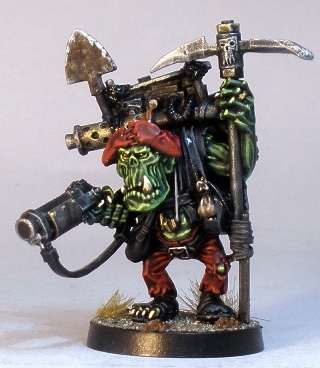 Being an ork Weirdboy he also likes to live as a hermit far from the rest of his kind, as the psychic energy buildup caused by proximity to the boyz gives him headaches. Of course, when Nazgrub takes part in the running, jalopy, shouting and large calibre gun filled fights common on GorkaMorka that same energy builds up into huge green lightning blasts that shoot from his head. 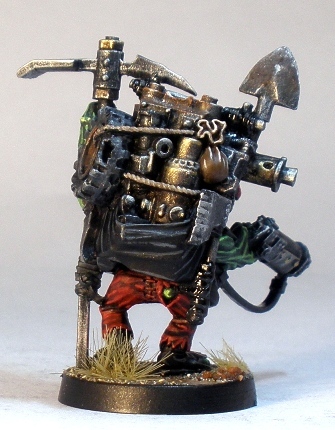 I like the idea of the crotchety old prospector ork that doesnt like the company of his peers. I imagine that Nazgrub has a rocking chair on his porch where he sits muttering to himself when not digging for scrap or shooting green psychic blasts. L to R: GW ork (with Ramshackle Games weapon), Nazgrub Wurrzag, GW ork (with Kromlech head). I painted Nazgrub to match the scheme on the rest of my orks (the Bigdogz). A nice set of leathery browns would have looked nice on the model for sure, but I wanted to keep things simple and relatively uniform. I like to mix miniatures from various manufacturers in my forces. Sticking to well defined palettes helps to keep them coherent. You did this characterful model justice! Good to see he actually fits in pretty well with the Space Ork plastics, I’ll have to fit him into my horde at some point. I could have spent more time detailing the various bits of scrap and other nice details on the model than I did, but expediency and adherence to the army palette won the day. I concentrated on the face as it is so nicely sculpted (and the huge face is the most important part of an ork model anyway), but I didnt reallly paint it to a higher standard than the rest of the army. The model looks fine alongside the GW plastics I think. You have done a top job.I just hope GW bring out some new orks soon as the current models are getting old. Perhaps they will bring out Gorka Morka the return ? Its funny, I still regarded the plastic orks as being “new” until you mentioned it. They plastic orks are not new of course, being ~13 years old now. Its hard to predict what GW will release these days, but I am guessing that a return to GoMo is not high on the list. With the Space Hulk and Dreadfleet releases over the last few years its hard to say for certain, but I expect that a Necromunda sort of thing would get a (re-re)re-release before GoMo. GoMo didnt dell very well when it was released IIRC. One tiny thing I think you need to do is to paint the stitching in his hat in a different colour, it looks a little odd as it matches with the hat. Same for the stitches in his britches. Thanks Otto. I was very tempted to spend some more time on the interesting bits of scrap and other little bits and pieces (like the stitching) but I have a pile of other orks waiting, so sense prevailed. As for the stitching matching the colour of the material, it all really depends on whether Nazgrubs hat was dyed before or after construction 😉 I do agree that the stitching in the hat probably deserves five more minutes spent on it though. We will see if I have got around to it by the time we get our game in at the end of Jan.
My Badrukk model arrived this morning actually. After seeing your model before Xmas and with a plan for various sci-fi pirate related project elements in 2014, I decided that I had to pick one up. That model combines some of the best aspects of the modern GW era and the RT Freebooter elements. Its really exceptional. Do you by any chance have any old pirate-y orks for trade? I would love to get my hands on a few of those guys. Badrukk is as fine an Ork model as was ever sculpted. Sadly I only picked up a couple of them freebooterz back in the day. I must have had higher purchase priorities at the time unfortunately. Wish I picked up some of the old Madboyz while I was at it! I have them “tasteful” sculpts earmarked for Badrukk’s Flash Nobz mob along with the Ghazkull conversion guy. Yeah, I figured that you didnt have any duplicates. Oh well. I reckon that I will tag on a few pirate themed boyz and grots to the Bigdogz, in largely the same colour scheme so that everything serves double duty. The addition of some piratey heads will do the trick anyway. 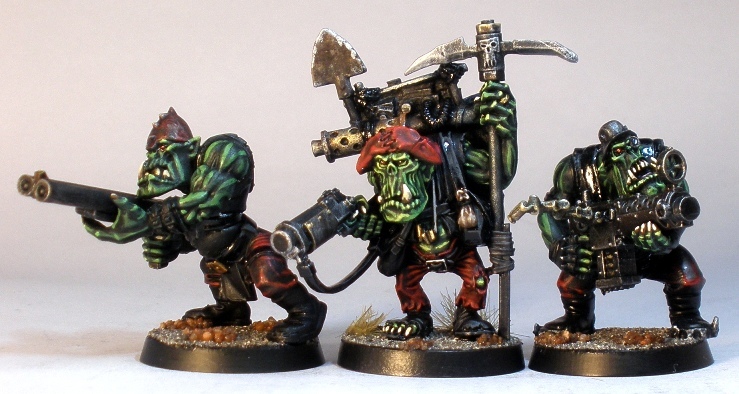 They are bound to come up on Ebay eventually, might be a good idea to set up an alert for “ork freebooter”if that’s possible. 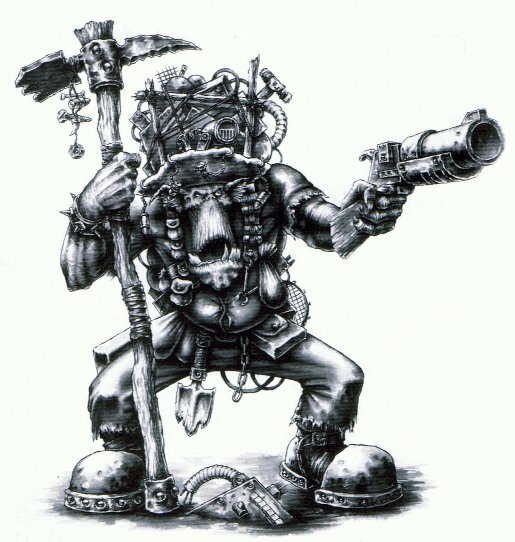 You won’t have much trouble converting some as a pirate’s look is primarily in the headgear, with the odd hook hand or peg leg – for example my Ghazkull conversion to pirate was literally just putting a big piratey hat on him and attaching as many banner poles as would fit! If I expand some of the boys out in a scallywag direction then it will be via Maxmini, Spellcrow and Kromlech heads. A few bucks spent there is way less time consuming that sculpting a load of hats, even if your Ghazghkull conversion worked really well. Ohh you got the powerclaw cigar chomping one? Nice, he is the best of the lot IMO. Yep, he is the best. I do really want the cybork body pirate too though. The rest I can take or leave really.